The landing stage which floats on the water of Llyn Padarn here was previously used for medal presentations in the London 2012 Olympic Games and Paralympic Games. 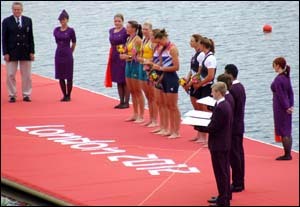 Millions of television viewers watched male and female rowers receive their medals on the floating pontoon at the Eton Dorney rowing and canoeing centre, near Windsor. The Olympic rowing regatta from 28 July to 4 August 2012 was the most successful ever for British rowers – who won gold in four races, silver in two and bronze in three. 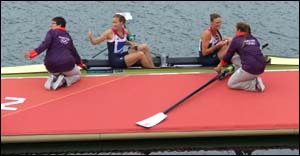 The victory of Helen Glover and Heather Stanning in the women’s pairs was a particularly exciting occasion for the host nation, as it was the first gold-medal finish for Britain in the 2012 Olympics. The pictures on the right show them arriving at the pontoon and during the medal ceremony. The pontoons were built by Poralu Marine in France and installed by Nautic Marine Ltd of Hampshire. They were covered with a red carpet for the medal presentations. The landing stage was acquired by Gwynedd Council in 2013 and installed at Llyn Padarn for use by the public. Many people enjoy watersports such as kayaking, rowing and canoeing, on the lake, which is also the home territory of Bangor University Boat Club. Llyn Padarn itself was the venue for the rowing events in the 1958 British and Commonwealth Games, hosted by Wales. Some of the races were challenging for the rowers because a stiff breeze ruffled the lake's surface!